I was a little sceptical about this energy work but kept my mind open, received the empowerment attunement and tried it – and wow – I was blown away by the speedy solution I found! Its now a big part of my every day life – an extremely useful tool for restoring calm and banishing chaotic energy not of my making. Chaos is a primordial state said to be a seat of creation in which all the order we know in the Universe arrived. It is used as creation and magical energy by some people. Indeed out of chaos order can arrive. Order is needed for physical form. For some, their energy is more closely linked with the field of chaos and for those people, they can function well within it. It is natural to them and they are comfortable living in that state. Most people do not thrive in chaos, and need some kind of order to thrive. Those of us who are very sensitive to the energies of others and the world around us need a little help to press the re-set button when we feel our energy has been disrupted by external influences beyond our control. Chaos is felt most strongly by those of us who tend to our energy fields regularly to keep them in order. We notice when we’ve encountered an energy that is discordant and throws our own energy out of sync with itself. People who don’t feel subtle energies on a conscious level, yet notice that their own energy is lower or they are in a low mood after they’ve been in a public place or around certain people will also benefit. When you are near people whose lives are in chaos or who seem to stir up chaotic energies naturally, your own energy centres and auric field can take on some of that way of being. If you do not like your energy field being shifted by chaos, sometimes affecting you long after encountering the source of it – you’ll enjoy the Chaos Flush quick restore. Chaos Flush energy system works quickly and thoroughly to flush away chaotic energies that may have collected in your energy fields. 1. 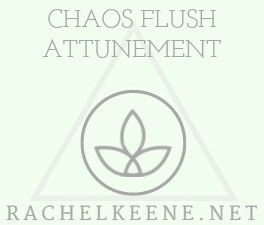 Click on the Book Now button below and select Chaos Flush Attunement from the list. You will be directed to my online calendar to book your appointment which is also confirmed by email. Appointment times are between 12 and 5pm UK time Mon to Fri. I can sometimes attune in the evenings midweek UK time, please look for those time slots on my calendar. You will need to bear in mind you need to be relaxed and undisturbed for at least half an hour at the appointed time of each attunement. 2. You will then be directed to make your payment via PayPal but you do not need a PayPal account to use a debit or credit card. 4. Your manual will be sent in a separate email. 5. An Emailed Certificate will be sent to you after you have received your distant attunement. Full email support will be given before, during and after your attunement whenever you have questions.